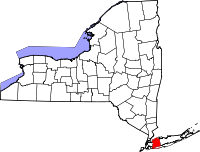 With about 1,400,000 residents as of the 2010 census, Nassau County has the 5th largest population in all of New York State, only behind the five counties that make up New York City. Situated on Long Island, Nassau is one of the richest counties in the entire country, and is, in fact, the richest in the entire state as the median household income is nearly $100,000 per year. Birth and death records are maintained at the local town level by each town's respective clerk. Marriage records are generally handled in a similar manner, though the office of the County Clerk does have some on file dating from 1907 to 1935. The Clerk's office also has land records, naturalization records, criminal and civil court records, and others. Most are open to the public with the exception of those few that are sealed. Note: Switchboard - 516-571-3000. Clerk's Records Dept located in basement, 516-571-3245. Research done in Rm #111.